Construction Accidents: Who Is Responsible? Enter your location to find a personal injury attorney close to you. See local personal injury attorneys in your area. Accidents involving larger commercial vehicles often yield the most damage - call our firm today. If you were attacked by a dog, talk to the team at Cohn & Swartzon today to learn your rights. Last year, 6.4 million people were involved in auto accidents – were you one of them? Call us today. Attorney Gerald Marcus talks about the dangers of a slip, or trip, and fall accident. The Law Office of Gerald L. Marcus discusses an injured driver’s options after a minor accident. You only have one chance to settle your insurance claim. Make sure an attorney is there to protect you. With so many personal injury attorneys out there, it can be a daunting task to begin the search for the right attorney in your area. Whether you have been injured in a slip and fall accident or auto accident, have been bitten by a dog or have been injured due to medical malpractice, you may have the right to file a lawsuit against the person or party responsible for your injuries. In fact, you may be able to recover significant financial compensation that will allow you to pay for medical bills, lost wages, and much more. We created our directory with the purpose of helping people just like you find the right personal injury attorney for their particular case. With our extensive listings and helpful information about personal injury law, you can learn more about your case and also find a skilled lawyer in your area. It's fast and easy to locate an attorney in your area. Simply enter your location in the space provided above, or click here to find a personal injury lawyer. Financial Compensation: What is My Claim Worth? Determining Liability: Who is Accountable? A serious accident has occurred, causing catastrophic injuries to you or to someone you love. In this situation, it is imperative that you enlist the help of a legal advocate who can protect your rights and interests. Depending on your specific situation, it may take a great length of time to fully recover from your injuries and you may be left with overwhelming medical costs, without a steady income to pay the bills. You may have the right to seek compensation from the parties responsible for your injuries, but you need the help of a Los Angeles personal injury lawyer. 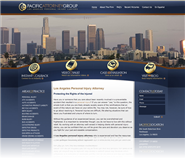 With the help of a lawyer at The Pacific Attorney Group, you will greatly increase your chances for recovering financial compensation and reaching a just verdict. Our firm has over 35 years of collective legal experience and the extensive resources that you need in order to achieve your goals for your personal injury claim. During our years of practice, we have seen first-hand how our clients have benefited from our dedication and legal knowledge. Our lawyers have recovered millions of dollars for our clients so that they can rebuild their lives and fully recover from their injuries. If you have suffered injury in a slip & fall accident, defective product accident, workplace accident or any other type of accident caused by the recklessness of another, contact a Los Angeles personal injury attorney immediately! You may be hesitant about filing a claim or taking your case to court, but it is important for you to hold the irresponsible party accountable for their actions. When you enlist our help, you can focus on recovering from your injuries while we handle the complicated legal processes. Our legal team will partner with you during this trying time and will vigorously defend your rights both in and out of court. Can I sue if a car hit me while I was riding my bike on the road? My daughter was killed by a speeding big-rig, should I file a wrongful death claim? Can I sue the Catholic church for being molested by a priest 39 years ago? Law Firm of Aaron A. Herbert, P.C. 2 Do You Need a Rabies Shot for a Dog Bite?